Sewage water running along the James Walter Francis Highway. 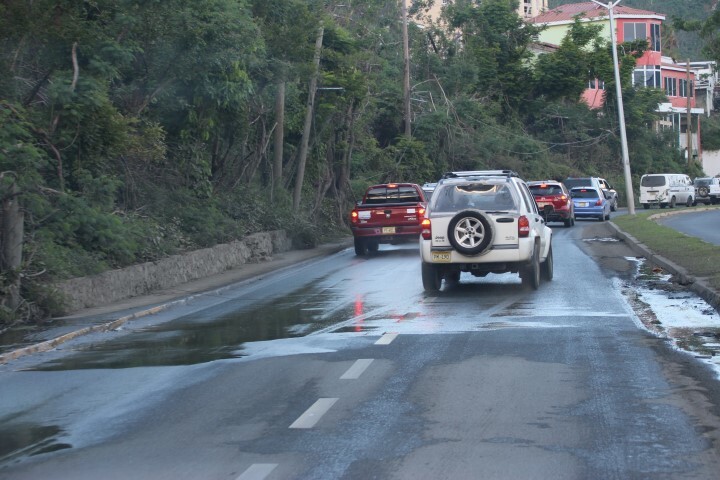 Motorists and pedestrians traversing the James Walter Francis Highway are being told that they will soon be able to breathe a sigh of relief as plans are afoot to correct the disturbing issue of sewage water flowing along the roadway in the vicinity of the BVI Red Cross. Permanent Secretary in the Ministry of Communication and Works, Anthony McMaster said his ministry is aware of the issue and within the next few weeks will have it addressed. “What is happening is that we have two issues: we have a collapsed pipe underground and because of the collapsed pipe, the sewage is unable to flow how it normally would. So, if it’s accustomed to flow at a 100 percent it is probably flowing at 30 percent. In addition to that, the pump station that services that area is still without power. We are waiting on power,” McMaster told BVI News Online. According to the Permanent Secretary, there are still two out of the six sewage pumps in Road Town that has not been powered up. Describing the situation as unfortunate, he said work is underway to have it corrected. He was unable to say how much it is expected to cost to have the matter corrected. Meanwhile, he explained that not all the water seen in that vicinity or running along roadways throughout the territory is related to sewage.